▲ apart from a handful of visitors to Minyip, the small town setting for the Flying Doctor TV series that ran from 1986 to 1993. ◄ Or Nick Cave fans visiting Warracknabeal , where he was born. In fact he departed pretty early on and until they get the money together to erect a Nick Cave statue there isn’t much connection, apart from driving by the house where he spent those first three years. He didn’t go to school here and he was certainly far too young to be hanging out at any Warracknabeal pub. 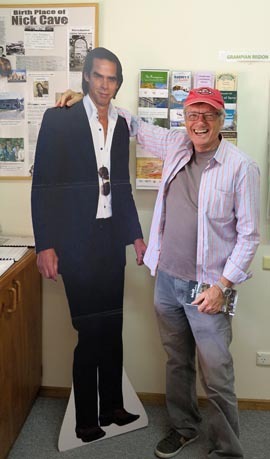 The Tourist Information Office does have a Nick Cave cutout and it appears quite a few visiting fans pose with it. 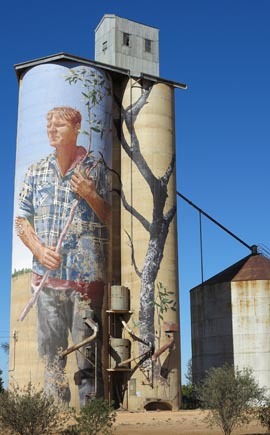 ▲ Then in 2015 artist Guido van Helten painted portraits of four local farmers, three men and a women, across six silos. 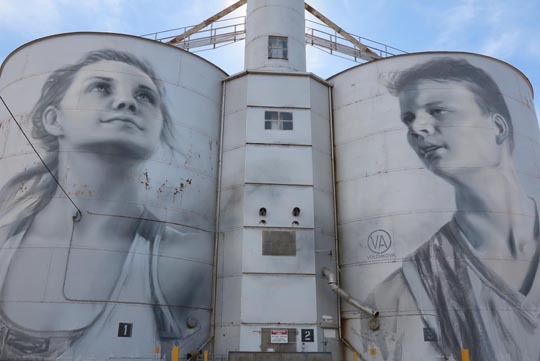 His portraits are big, they stretch for 40 metres (130 feet) across the 30 metre (100 feet) high silos and have a wonderfully washed-out ghostly feel. 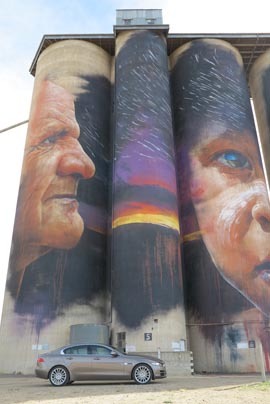 Plus they inspired other artists to come along and paint more silo art. 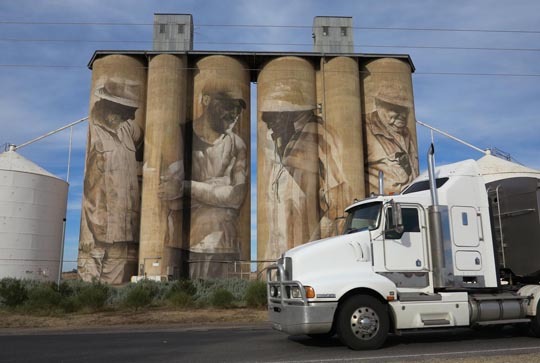 Today there are six silo art sites stretching over 200km from Rupanyup in the south to Patchewollock in the north and there’s a steady flow of visitors from Australia and further afield driving through the world’s largest portrait gallery. ▲ I started at Rupanyup where two metal silos feature two local young people – a female netball player, a male AFL footy player – painted by Russian artist Julia Volchkova. Plus we stopped in to Rupanyup Living, a local craft and coffee shop taking advantage of the new tourist flow for the silos. ◄ Then it was the visit to Nick Cave’s hometown Warracknabeal and the original silos at Brim before reaching Rosebery. 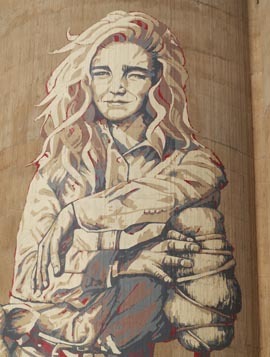 Artist Kaff-eine hung around for five months getting the feel of the Mallee before she painted a young woman and a man and his horse on two silos. From there we continued to Hopetoun for the night, it’s a slightly down-at-heel town, Warracknabeal would have been a busier place to stay, but the Hopetoun Community Hotel is comfortable (if very straightforward) and the food in the bar is good, pub-food regular and nothing wrong with that, or the A$30 bottle of Shiraz. ◄ Our penultimate silo town was Patchewollock – which is properly the end silo, but we looped past it. The name is from the Aboriginal words putje – plenty and wallah – porcupine grass. It’s a centre for mallee fowl, which are mound builders, like bush turkeys, and they are celebrated by two big corrugated-iron mallee fowl sculptures. Sheep racing and a country music festival are other Patchewollock attractions. Here the long and lanky image of Nick ‘Noodle’ Hulland is by Fintan Magee who takes some inspiration from Belfast street art paintings. Finally we arrived at Lascelles – the sixth and final silo stop – that was 218km from the first silo at Rupanyup and Edward Harewood Lascelles was the ‘father of the Mallee.’ The art work at Lascelles is of a local couple Geoff and Merrilyn Horman in a faded, ghost-like style by Rone.